Lady of Perpetual Chaos: Ready For Christmas?! Well, it's coming....ready or not. But we have accomplished a few of the Chaos Family traditions to help get this party started around here. 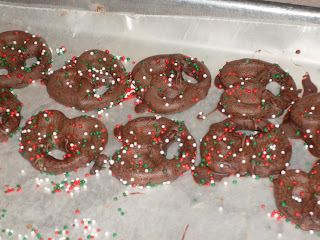 We've been making yummies....toffee and chocolate dipped pretzels. 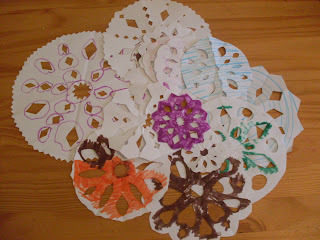 Made snowflakes for the windows. Colored snowflakes. The brown one might just be my favorite! 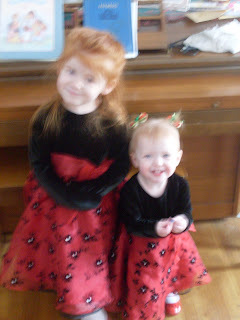 Attempted pictures in their beautiful Christmas dresses from Grandma Van. 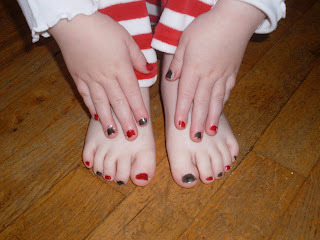 And, most importantly, the Christmas Pedicures! WE'RE READY, SANTA!!! MERRY CHRISTMAS!!! I hope you and your family have a very merry Christmas! I am glad you are ready. Our boys are getting coal. I am totally serious. 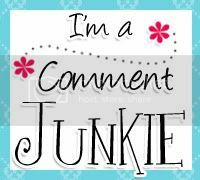 Check my blog tomorrow night and you will learn all about it.Merry Christmas. I just love having you in the neighborhood even if most of our communication is via the internet. Merry Christmas. Who doesn't like a brown snowflake! You've taken the domestic godess crown back! Merry Christmas and maybe i'll be seeing you around the New Year!? Merry Christmas! I hope you had a great Christmas with your family. The dresses are adorable and I had to laugh at the Christmas toes! 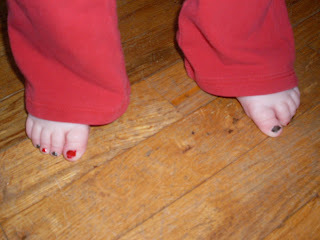 Nature Girl and I have the same toes right now! Except our green is a Shrek colored green. 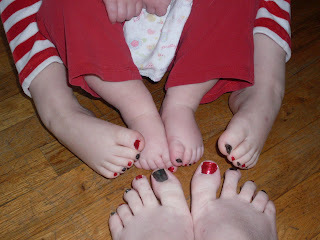 We even have the same pattern going on our toes and I took a picture like yours. I guess great minds think alike!